BP-funded research aims to understand and mitigate impacts of hydrocarbon pollution in the Gulf of Mexico and elsewhere. (From physicstoday / by Rachel Berkowitz) — On 20 April 2010 the Deepwater Horizon (DWH) drilling rig operating in the Mocando Prospect, a drilling block in the Gulf of Mexico, experienced a catastrophic failure that resulted in an explosion and fire, the ultimate sinking of the rig, and a discharge of gas and light sweet crude oil from an ocean depth of 1500 m. Eleven men who were working on the rig at the time of the explosion lost their lives. A month later, BP committed $500 million over 10 years to fund independent research on the environmental and public health impact of the blowout. On 15 July, a steel cap was installed to plug the bottom of the gushing well; by 19 September the borehole itself was sealed. To understand the disaster’s consequences, BP initiated the Gulf of Mexico Research Initiative (GOMRI), which includes eight research consortia comprising dozens of universities. GOMRI studies have estimated the rate and volume of petroleum released during the event, the mechanisms by which hydrocarbons move through the Gulf environment, and the impact of oil and gas on ecosystems. Despite GOMRI’s advances in understanding oceanographic effects associated with the spill, many uncertainties remain. Two of the more pressing unsolved questions are how to determine the ecological health of the Gulf of Mexico, and how events in coastal regions connect to deep-ocean processes. In a marine basin near any populated area, urban development and industrial activity affect freshwater supplies and contribute to oxygen depletion, coastal erosion, and other ecological concerns. “The massive input of pollution and residual effects of the DWH discharge comes on top of this background level of challenges to a healthy ecosystem,” says Ian MacDonald, professor of biological oceanography at Florida State University. The connections between the deep ocean, where DWH began to spurt oil, and the coastal zone are far from obvious. Some 80 km away from the stricken rig, the Mississippi River delta and beaches of Alabama and Florida are regions of extensive human interaction with the marine ecosystem. Oceanographers categorize ocean depths based on how much light they receive, and additional factors of wind mixing, thermocline, and shelf forcing affect each level. “We know the shallow realm is connected to the deep—things sink, and upwelling occurs—but we don’t understand it that well,” adds MacDonald. River input to the northeast Gulf further complicates ecological relationships. Productivity—the rate of biomass generation—in the Gulf depends not only on basin dynamics, but also on Mississippi River outflow. “The spill highlighted how little we know about this part of the Gulf, and the ocean in general,” confirms Richard Snyder, director of the Center for Environmental Diagnostics and Bioremediation at the University of West Florida. The oil on the ocean surface that came ashore on coastal marshes and beaches most upset the general public, perhaps because its effects were most immediately visible. But of possibly graver concern, the science community lacks detailed information about the physical processes by which oil moved from its source at 1500-m depth to the surface. The response effort to the event did not include fundamental measurements, including regular profiles of the plume or samples of the surface oil. 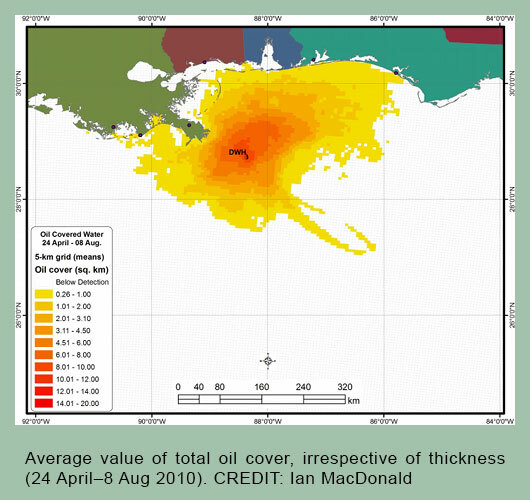 The data shortfall means that the distribution of oil thickness in the surface slick, and how it spread throughout the Gulf, is not well known. Mathematical modeling informs much of our knowledge about changes in dissolved volatile organic content in the water column, amounts of surface oil, and droplet size (as affected by application of dispersants). Measurements against which to calibrate these simulated results, including time series made over the course of the event, would greatly improve the models. MacDonald’s lab works with synthetic aperture radar data shared through international cooperation to provide hundreds of remote sensing images covering a large region in the northeastern Gulf. The goal is to create a daily time series of the oil location and provide a global gridded map. Those images will also be used to determine the distribution of oil thickness. “Modeling is constrained by lack of data,” says MacDonald. “My objective is to have a data set of surface oil over time where we’re totally open about how confident we are, and share this with everyone who is concerned.” Such data might be applied, for example, to the location of fish larvae and the dispersal of spawning populations during the spill. Incorporating this information into a spill model would help provide an estimate of oil exposure to biologically sensitive areas. Another reason for developing a standardized time series for the disaster is to measure the efficiency of different response activities. Is it more efficient to apply dispersants from airplanes or to introduce them at the wellhead? Is it better to burn or skim surface oil? To evaluate these methods rigorously involves being able to objectively say what each achieved under specific conditions. “The rising plume is how everything got to the surface, and the surface is how everything got to land and the coastal region,” notes MacDonald. But the combined oil and gas bubbles coming out of the Macondo well created a multiphase plume of petroleum products more complicated than the classical laboratory model. The classic buoyant plume model comprises a buoyant source that rapidly becomes unstable, breaks down into eddies, and entrains surrounding water. As the plume rises, mixes, and dilutes, it eventually reaches the surface or some equilibrium distribution. In the Gulf of Mexico following the DWH blowout, large drops of oil rose straight to the surface. Other particles spread out at intermediate depths, creating nutrient-rich water for organisms that can eat hydrocarbons. As a plume forms, a rotating gyre effect may help to confine its output to near the source for some time. Eventually, these gyres become unstable and break from the source, which may have been an important mechanism in the distribution of subsurface oil, according to physical oceanography professor Kevin Speer of Florida State University. Once the oil reaches the surface, its physics becomes controlled by wind and waves. Typical ocean models treat the upper 10 m of ocean as a thick grid, and assume uniformity within this layer. But the oil slick existed in the upper millimeters of water, so standard ocean circulation models cannot predict its fate. The effects of the plume were felt by the entire Gulf of Mexico due in part to the Loop Current, which flows north into the Gulf, feeds into the Gulf Stream, and, on its way out of the Gulf, generates large, westward-moving eddies. The Loop Current runs mostly south of the oilfield. “But wind can blow the oil south, and some wiggles to the north, that spreads the oil much more quickly,” says Speer. “What happens at the surface doesn’t necessarily go along with what happens at depth, but helps us understand conditions under which oil might rapidly fill the Gulf.” And oil on the surface calms the water beneath it. Thus, the DWH event has necessitated better representation of plumes in large-scale circulation models, a need that has many of its own technical problems. Any geophysical modeling must balance the size of the domain and the level of descriptive detail. Ocean models typically have a resolution down to the kilometer-scale. But much finer than that, computational costs become prohibitive. As a result, modelers describe so-called sub-grid processes through parameterizations that in turn use derivations from the basic governing equations explicitly written for large-scale features. Parameterizing plumes to incorporate them into a large-scale model requires attention to small-scale effects. “This has been done . . . by meteorologists because they have to parameterize clouds,” explains Speer. But unlike the buoyant plumes of vapor that define clouds, an oil plume contains pressurized gases. When a non-water-soluble buoyant fluid mixes with gas, the rising bubbles will pull water along. It is therefore critical to better understand how bubbles influence the plume in order for the parameterization to capture the key elements of the dispersion process. Plume movement since the DWH event has been tracked using a combination of tracers, floats, and current meters. These tools help quantify how much the oil and gas are being spread by turbulent mixing relative to spreading as a result of dispersal by large-scale currents. At De Soto Canyon, in the Gulf due south of Panama City, Florida, the surface oil slick has moved up shore. Speer and colleague Nicolas Choplain suggest that it is primarily the shape of the ocean floor that controls the direction of oil movement. They have collected measurements of the circulation within the canyon to support their claim. Additionally, a laboratory simulation that builds the shape of the canyon into the base of a water-filled, rotating tank (to approximate Earth’s rotation) will help provide a history of topographic control on surface effects. Offshore drilling and production is often associated with deltaic systems. Rivers deliver organic matter with fast sedimentation rates, and can bury organic matter and spread pollutants. “If you are trying to preserve the marsh systems by opening [river] floodgates and flushing the system so that it doesn’t contaminate the marshes, there are more complications,” explains David Hollander, professor of chemical oceanography at the University of South Florida. Flushing transports fine-grained clay particles offshore, and brings contaminants to shallower sites on the continental shelf that then move directly through the food chain. That’s what happened when the Mississippi River floodgates were opened in response to the DWH blowout. The intersection of subsurface plume with continental slope sediments put toxic compounds into the sedimentary system, because oil microdroplets are so readily trapped by sediment surfaces. The “dirty blizzard” hypothesis suggests that oil mixed with deep ocean sediments fell to the sea floor at 10 times the normal deposition rate. This includes such toxic components as polycyclic aromatic hydrocarbons, or PAHs, produced as a byproduct of burning fuel. “This is the fascinating story,” says Hollander. “Not only would this be a natural process, but could be augmented by application of dispersant, which lends to the formation of finer droplets with increased surface area.” One goal of dispersants is to keep components in an aqueous environment where they have a residence time of weeks to months. But if those materials are brought into a sedimentary environment, the residence time increases to months, years, or decades. Enhancing the concentration of those compounds in sediment becomes a potential mechanism by which they are more efficiently transferred to upper trophic levels of the marine ecosystem, where economically important fish dwell. Supporting this theory is the observation that the frequency of fish disease is now greatest at depths between 100 and 300–400 m, in line with the margins of the continental shelf. “One beautiful thing we have from sediments is an approach to resolve timescale [of DWH spill products] from months to years,” adds Hollander. Typically, lead-210 isotopes with a half-life of 22 years are used to provide a time series of Gulf of Mexico sediments. But this provides little accuracy for smaller time windows. Now, thorium-234 with its half-life of 22 days has been measured for six half-lives to provide a four-month chronology. Thus, taking core samples with a time window of four months allows an entire sedimentary pulse event to be pieced together. Hollander’s work suggests that material reached bottom sediments and accumulated in a way associated with PAHs, leading to exposure for primary organisms and with subsequent uptake through the food chain. Fortunately, although organisms higher in the food chain are adversely affected by oil spills, microorganisms are able to consume petroleum hydrocarbons and thus contribute to reducing their impact. DNA and RNA analyses suggest that different microbial groups fed on the DWH hydrocarbons at different times. New models suggest that once a bacterial community had depleted the new food source, they would linger and then, should another pulse of hydrocarbon come their way, degrade this more rapidly. “This science will help us understand how the environment absorbs or does not absorb oil spills,” concludes Snyder. The more we understand specific data, the more we can predict impacts relative to specific clean-up strategies. Some three to four years after the 1989 Exxon Valdez oil spill, people congratulated themselves that everything was back to normal in Alaska’s Prince William Sound. Then the Sound’s economically important herring fishery irrevocably collapsed. Many other permanent ecosystem changes, from top predators down to invertebrate communities also occurred. MacDonald notes that, despite the vast difference in the nature of these two disasters, the same paradigms regarding oil spills that were challenged after Exxon Valdez are being considered in light of DWH. This suggests that we have not yet learned to successfully mitigate such events. Speer hopes that in the wake of DWH, people will have a better sense of how to respond and make proper measurements, how to incorporate meteorological information into a Gulf-wide dispersion measurement system, and how oil as a nutrient source influences microbe composition of the ocean and shoreline. The physical oceanography community is motivated to better represent boundary conditions and small-scale effects in plume models. Hollander notes that DWH was “not your traditional oil spill.” This was a three-dimensional catastrophe: the first extremely deep-sea blowout. Responders and decision makers need to think about using new scientific information not only to forecast for future potential events in the Gulf but also to set policy for other sensitive areas. Additionally, the sedimentation process of large river systems bears on global oil exploration and production, since most drill sites are associated with large river systems. New paradigms are emerging as a result of DWH. With support from BP and others with an interest in ecosystem health, the scientific understanding coming from DWH could extend well beyond the boundaries of the Gulf of Mexico to other oil fields around the world. S. B. Joye, I. R. MacDonald, I. Leifer, V. Asper, Nat. Geosci. 4, 160 (2011). R. M. Atlas, T. C. Hazen, Environ. Sci. Technol. 45, 6709 (2011). D. L. Valentine et al., Proc. Natl. Acad. Sci. USA 109, 20303 (2012). C. H. Peterson et al., Science 302, 2082 (2003).